According to Chinese astrology, 2014 will be a stubborn year. On Jan. 31, the streets of the District’s Chinatown were filled with celebration as local Chinese Americans and other city residents as well as visitors from abroad gathered to celebrate the new year, known as the year of the horse. Of course there was a parade, and speeches by the mayor and members of the city council. . But it was a small group of determined teenagers who stole the show. In the summer of 2013, District school officials decided to close about fifteen public schools some of which have tremendous history when it comes to parades in Washington. Luckily Anacostia High School did not make the chopping block. The Anacostia Indian Marching Band (or as we used to call ourselves the Tribe) looked alive and well for the Chinese New Years parade. With four base drummers. two quad drummers two snare drummers and one horn player the Tribe dazzled the crowd. It seemed fitting to me that as the mayoral election approaches, the Anacostia Indian Marching Band would show itself. I missed seeing the Tribe perform at the Martin Luther King Jr. parade. Watching the members put their hearts into their routine made me wonder if we are really giving our youth all they deserve. Funding for arts and music programs in the schools could be much higher. And special attention should be paid to nurturing these programs in low-income communities, where they help kids academically and emotionally as well. The community needs to take a stand and push for these arts and music programs. Yes you do need English, math and science but not to the exclusion of art and music. I remember my own days in the marching band. For me the experience was great. I got to learn how to play a bass drum. I learned how to design a workout routine. I also learned how hard it is to wear a drum and dance at the same time. 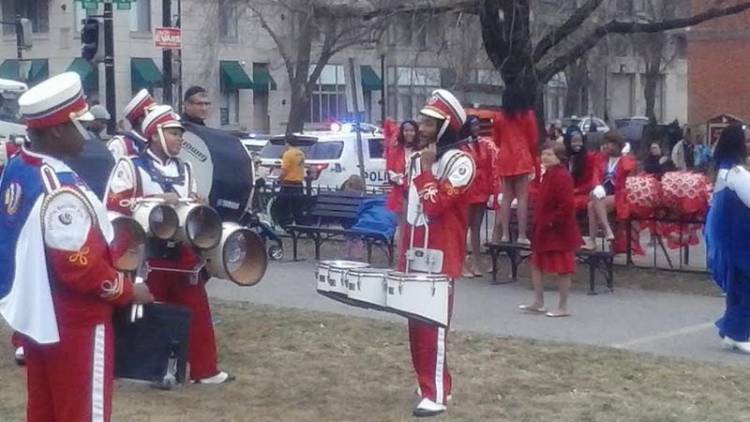 My participation in the marching band might have led me to college if I had the credits at the time. People in poverty need every resource man can create. I hope that these words written here will spark a fire for the Public School Marching Bands left in Washington. Those bands are a part of our history and legacy and we have a responsibility to maintain simple principles like marching to a beat with a line of people who feel just like you. This is my school and this is our show!